A collaboration between the Provost’s Interdisciplinary Activities Advisory Committee, the Dresher Center for the Humanities, and Summer/Winter Programs, UMBC Interdisciplinary CoLab provides students with an innovative team-based applied learning opportunity through a three-credit (4 weeks, 30 hours per week) paid internship in narrative-based research. 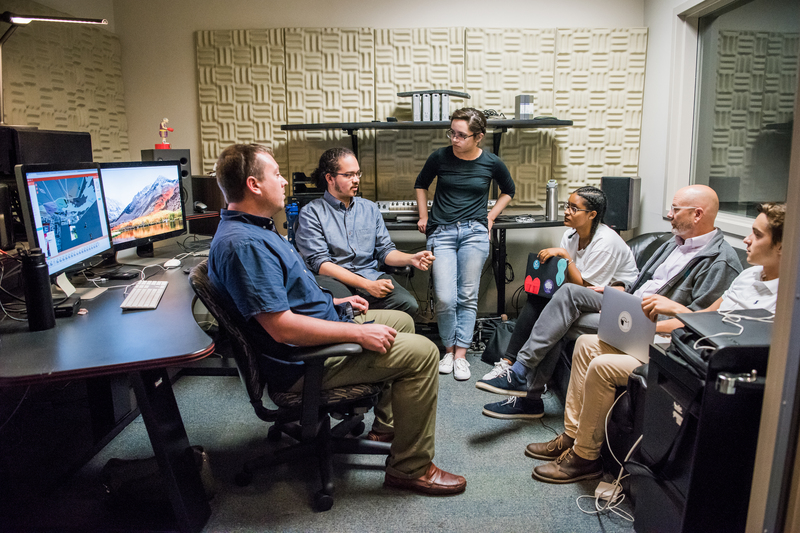 Interdisciplinary teams of undergraduate students work with a faculty or staff Project Leader to utilize diverse research methods, modes of analysis, and technical tools to produce public-facing final projects. The program objective is to provide students with a professional research experience while learning to tell effective stories and amplify voices to the general public. For example, projects could engage with archived texts and images to develop websites, build podcasts from oral history or ethnographic interviews, or work with communities on documentary films and digital stories. The program experience is very different from course-based group projects in which students work to master the same materials within a common disciplinary framework. Here, students from different disciplines spend 30-hours a week together to carry out primary research and create a project that meets the sponsor’s needs and specifications. Students learn things pertinent to their areas of study while learning from each other about different tools and approaches based on different disciplinary perspectives. To support their interdisciplinary learning and professionalization, the program provides students with workshops on collaboration, professionalism, narrative research, digital storytelling, interviewing, and research ethics, as well as weekly discussion sessions where each team receives feedback on their progress. Upon successful completion of the internship, students also earn a Digital Badge in Interdisciplinary Collaboration. During the fall semester, projects are solicited from UMBC faculty and staff, alone or in partnership with community organizations. PLEASE CLICK HERE FOR THE CALL FOR PROJECTS FOR SUMMER SESSION 2019. During the spring semester, students are selected through a competitive application process. In the summer of 2017, Provost Philip Rous, along with several members of the Interdisciplinary Activities Advisory Committee (IAAC), visited Duke University to learn more about their programs to support interdisciplinary undergraduate research. Among the programs toured, one was especially inspiring. It involved undergraduates, graduate students, and faculty engaged in interdisciplinary narrative-based research in professional teams for defined clients and project outcomes. In Fall 2017, the IAAC developed a formal program proposal that incorporated what they learned at Duke, the aims of the UMBC Strategic Plan, and our university’s strengths in interdisciplinarity and digital storytelling to develop a program unique to UMBC. With the Provost’s approval, Carole McCann, Special Assistant to the Provost for Interdisciplinary Activities, worked with an implementation committee to develop a small pilot program in the Summer of 2018. The committee included Jessica Berman, Director of The Dresher Center for the Humanities, Nicole King, Chair of American Studies, and Donald Snyder, Senior Lecturer, Media and Communications Studies, and Rachel Carter, Graduate Assistant to the IAAC. Given the tight timeframe, the implementation committee conducted an abbreviated solicitation of project proposals that relied heavily on the IAAC members’ suggestions of possible narrative-based research projects. Three were proposed and selected. At the same time, Carole McCann and Rachel Carter worked with Summer/Winter Programs Director, Beth Jones, and Coordinator, Natalia Panfile, to announce the program and student application on the Summer Session 2018 website and schedule of classes. The collaboration with Summer/Winter Programs produced a strong and diverse applicant pool from which the committee and project leaders assembled three teams of students who represented disciplines from across all three Colleges.